Ice cream has to be one of my most favorite things to eat, especially in the summer. There's nothing like this cold and refreshing treat to cool you off when it's hot and sticky outside. The only bad thing about ice cream is that I want more when I'm done. And it's dangerous, because there is an ice cream stand right around the corner of my house, which is where the above cone came from. 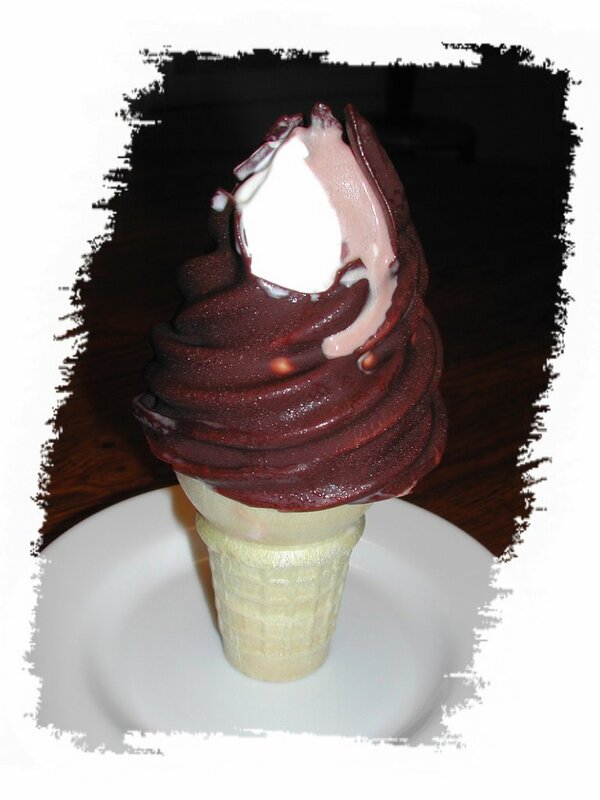 I remember when I was a kid, I would always get chocolate chip ice cream dipped in cowlic from Newport Creamery. . YUM! Actually, this is probably still my favorite. I love when the ice cream starts to melt and you have to try to eat it from the bottom before it gets all over you. It's quite the challange. What can I say, it makes me feel like a kid again! gosh ice cream is my favorite treat no matter what time of the year. And yes going to the Dairy Queen makes ya remember the dating years and the hangouts. The cherry dip is the best! I rarely see that around anymore. Some Dairy Queen's have it but we can't do DQ anymore due to my son's allergy. I don't really have a favorite summer treat. I love soft-serve ice cream, but I'll have that year round. Doodles, I love when food reminds us of the good ol days. Isn't it great how a little ice cream can bring us back to such great memories? DutchBitch, Thanks for stopping by. You'll have to stop by more often. I would love to know what some of your favorite Dutch treats are! Claire, Mee too! Although I love all pies! Paula, I never tried the Cherry dip but I did notice there were some fruit flavors. I'll have to check them out next time. A piping hot bowl of lentils.